All terrain vehicle GAZ-69 was created by a team of designers of the Gorky automobile plant. Testing of the prototypes took place in the late 1930-ies. From the beginning of the new machine comes in two versions. The first GAZ-69 with eight-two-door body. 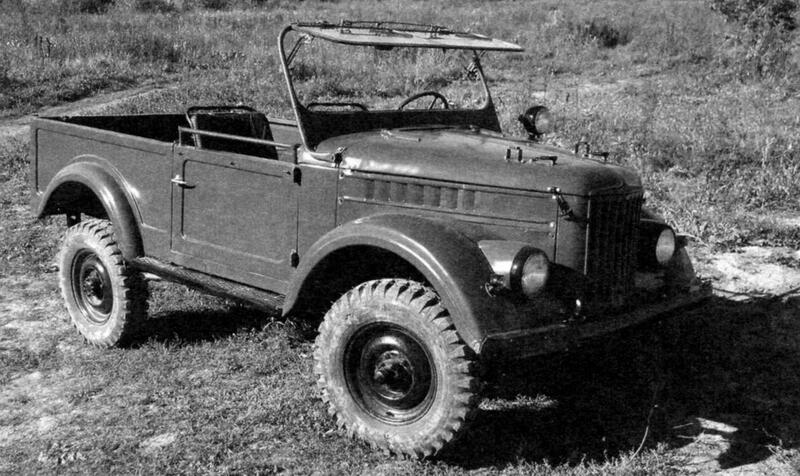 Their production of Gorky plant began in 1953, and in parallel (December 1954), these all-terrain vehicles to collect and Ulyanovsk automobile plant. Entirely to the production of GAZ-69 and its modification GAZ-69A of the nodes of its own production of the UAZ passed after 1956. The Gorky plant from mid-1955 began to produce m-72 – the second modification, the original machine, which combined the chassis of GAZ-69 with a body “Victory”. This car went off the Assembly line until 1958. In addition, using the units of GAZ-69, the carmaker did amphibious GAZ-46. Over time, the production of “sixty-ninth” has transferred in Ulyanovsk – the plant, which was collected lorry – trucks GAZ-MM. 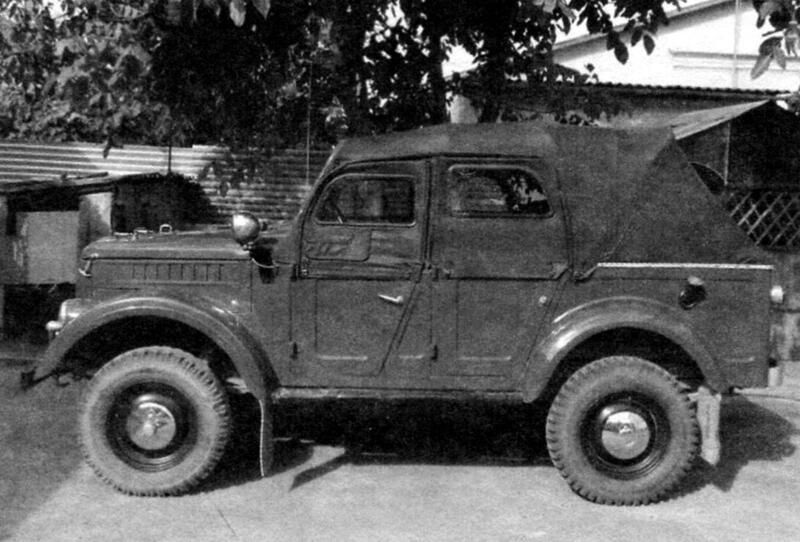 In addition to the two modifications of GAZ-69 that went into the series, there were several varieties of it, and came out of the prototype stage. One of them, GAS 19, were related to vehicles. 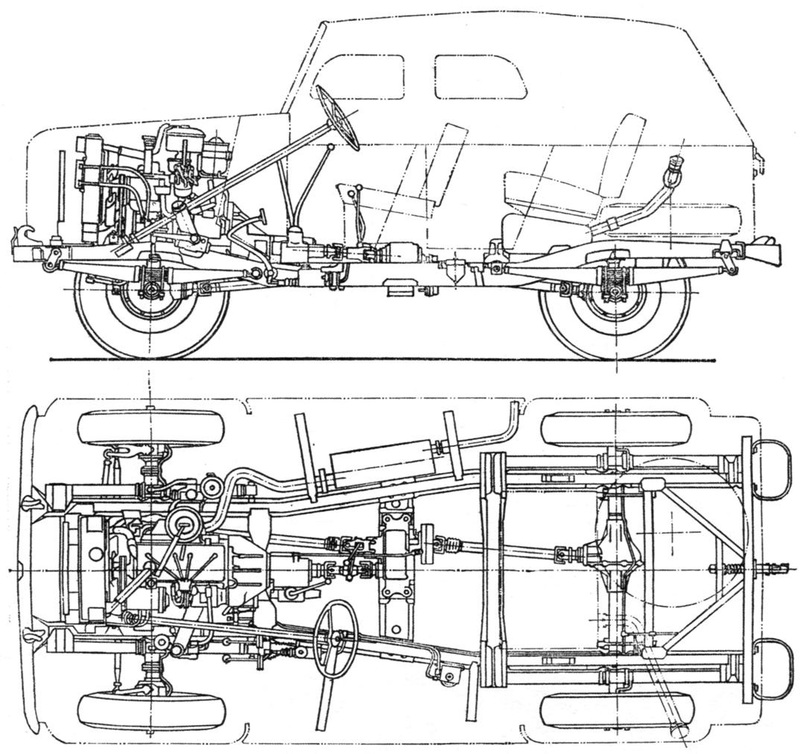 Indeed, instead of the front axle, the car had a forged I-beam suspended on longitudinal leaf springs. 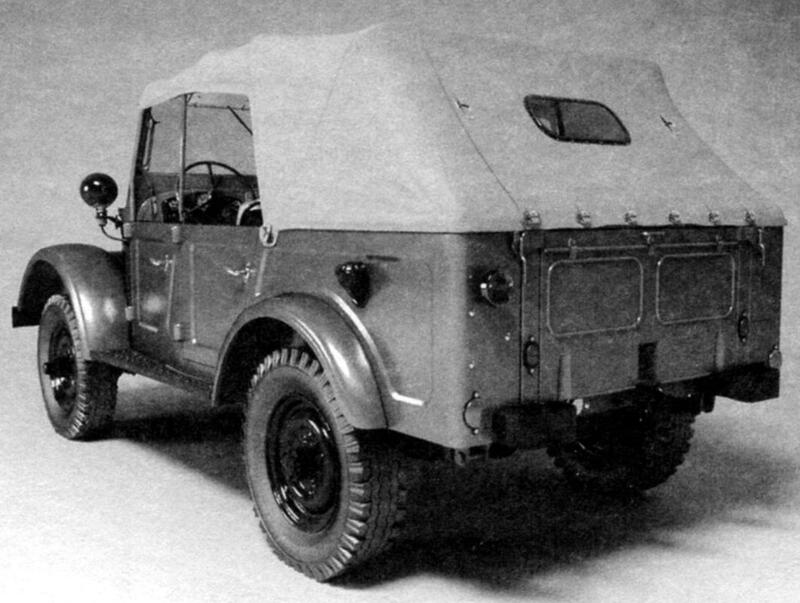 GAS-19 was designed to carry mail and was equipped with a closed three-door body. However, in production it did not come out of nowhere to borrow front, non-powered axle. Such cars (UAZ-451) since 1960, began to produce in Ulyanovsk. 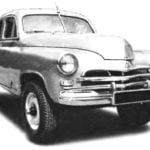 After the GAZ-69 the designers of the Gorky automobile plant has developed another, more powerful “SUV”; its prototypes (they appeared in 1956) was called GAZ-62. Externally, the car resembled as if grown-up GAZ-51: limited slip differentials, sealed wheel brakes, there was a winch. GAZ-62 could carry 14 persons or 1 ton of cargo. His speed was 80 km/h. Later, in 1959, on the same factory Assembly line went to a party one-ton truck terrain GAZ-62 with engine from GAZ-51 and the cab above it. Manufacture of truck-terrain vehicle, however, did not last long. From this experience, the designers developed a more perfect car GAS-66, delivered to the Assembly line in 1964. And the Ulyanovsk automobile? Since 1956 it full swing began to produce the GAZ-69, complementing the machine’s components and parts is mainly own production. But some of the units he continued to receive the bitter – for example, engine, wheels. 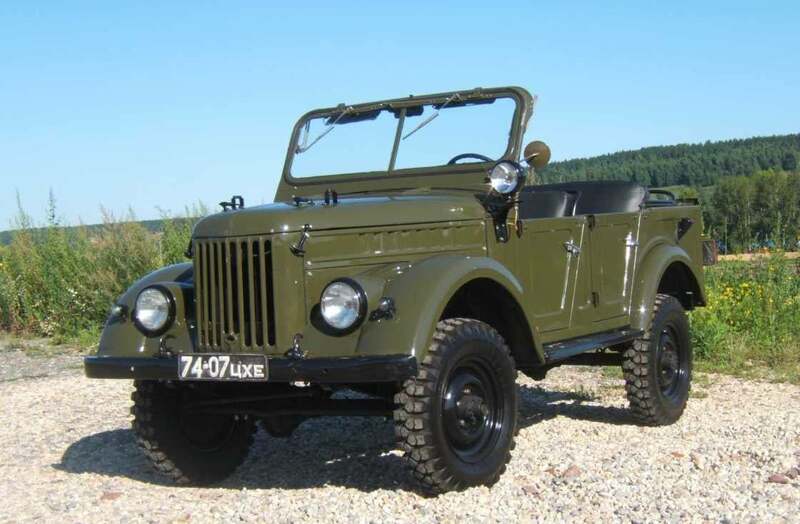 Ulyanovsk “jeep” quickly gained wide recognition not only in our country but also abroad. 1956 GAZ-69 began to flow abroad, and soon the number of countries buying them, exceeded fifty. Moreover, the type GAZ-69 started the production of cars Dickhouse plant in the DPRK. The Soviet machine was modelled by Romanian designers and engineering plant in Campulung. 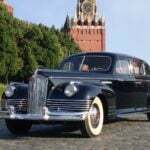 Soon the Ulyanovsk specialists under the leadership of chief designer P. I. Muzyukin began work on a promising machine, which was to replace the old “jeep”. 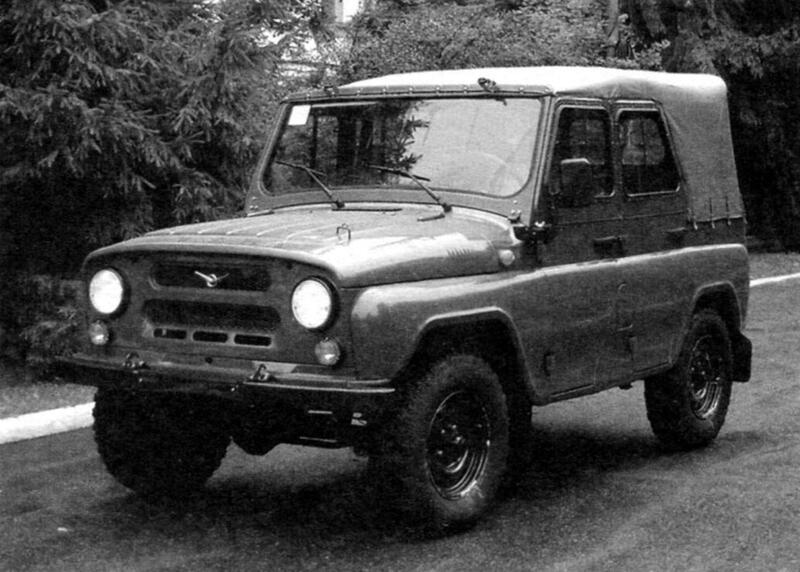 A prototype of the all-terrain vehicle UAZ-460 was first exhibited in 1962. In the fall of 1964 ended his test, and after debugging and rework in November 1972 UAZ-468Б replaced on the conveyor veteran GAZ-69. Of course, in nearly 20 years of production of GAZ-69 remained unchanged. Instead of 52 HP engine inherited from the “Victory” he got more powerful, the 55-strong. Changed drive manual brakes, were strengthened steering parts. GAZ-69 was used not only to transport people and small cargo. On its chassis, for example mounted anti-tank missile complexes, aircraft starting units, and more. 1970 GAZ-69 received more durable front and rear axles from the production of cars UAZ-452, clutch disconnect axle shafts at the hubs of the front wheels, enhanced brakes, new awning. First of all, I must say that no single node or single unit machine was not some sort of technical innovation. It successfully used time-tested elements, the combination of which increased their advantages and negate the disadvantages, and collectively reported machine performance. 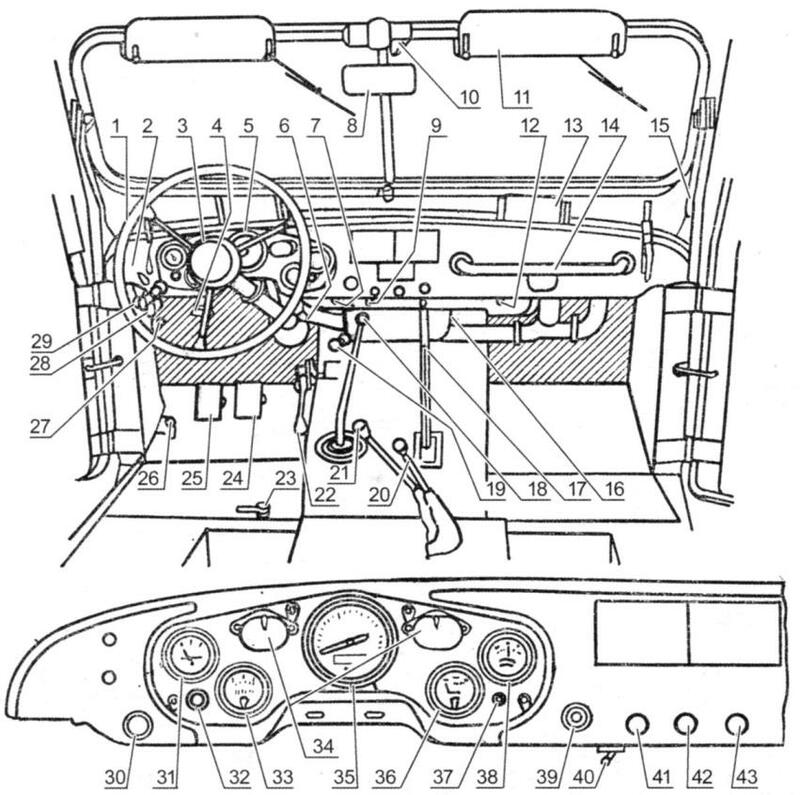 Engine, gearbox, steering, differential, shock absorbers, brakes, front fender, battery substantially aligned with the nodes of the serial passenger car. Thus cheaper production of the new car was made easier by the provision of its spare parts and facilitated repairs. GAZ-69 from the beginning was conceived as a simple device for a vehicle which is easily accessible for maintenance and repair nodes. The importance of these qualities in machines, which operates mostly in areas with dirt roads, far from repair bases, it is difficult to overestimate. Like jeep, “sixty-ninth” was a remarkable design? High ground clearance (210 mm), small front and rear overhangs, all-wheel drive, six-speed, short length, very good weight distribution along the axes, advantageously selected gear ratio in the transmission allowed her to walk confidently on the virgin snow, dirt. If the predecessor GAZ-67B with a somewhat smaller (1320 kg 1525 kg) weight and equal power of the engine had a secondary speed when driving on gravel roads 25 km/h, GAZ-69, it was 35 – 40 km/h. “Jeep” confidently took thirty-degree climbs, overcame the murky depths of 0.7 m and was able to tow a trailer weighing up to 850 kg. speaking of the trailer (GAZ-704). It was specifically designed for GAZ-69, weighed 340 kg, and could carry 500 kg of cargo. And the GAZ-69 in a two-door compact option when folded benches in the rear compartment was designed to carry half a ton of cargo. Thus, in combination with a trailer “shestidesiatniki” became the universal means of transport. Even more have expanded the scope of GAZ-69 hinged tailgate and the possibility of installing the stretcher. Both versions were equipped with a canvas awning with side walls, and the GAZ-69 they were made removable, and the GAZ-69A – folding. Differed both cars and the location of the spare wheel. At first it was on the outside of the left side of the body, the second was laying back on the bottom of the trunk. 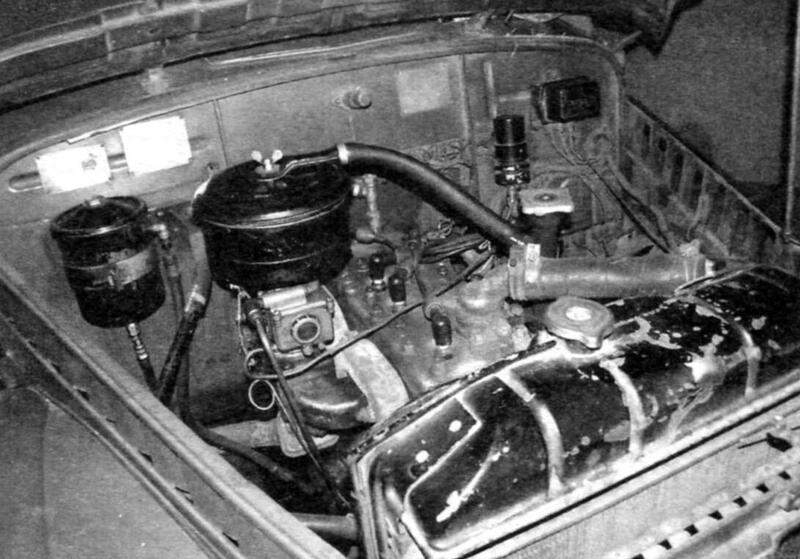 Different were also the fuel tanks: GAZ-69A single 60-liter in the rear of the vehicle, and GAZ-69 main 47 litre tank was placed under the floor of the body, and additional, 28-liter, under the driver seat. 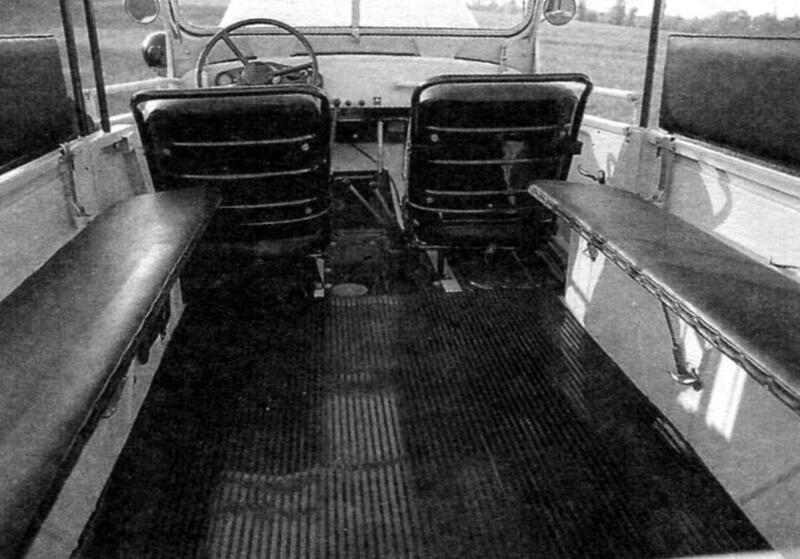 Transmission GAZ-69 included two-speed transfer box, which stood separate from the three-stage gearbox. Thus, the total number of stages in transmission was equal to six. The highest gear in the transfer case was straight. Therefore, when there was no need to downshift, the gear transfer box was loaded with a twisting moment and does not wear out. Because of reducing gear torque delivered to the drive wheels, is increased almost 2.5 times, then switched off the actuator on front axle there is a risk of overloading the gears and rear axle shaft. Therefore, the GAZ-69, the switching mechanism is designed so that the lower gear in the transfer case cannot be enabled if not enabled front-wheel drive. As is known, the system of front-wheel drive should include constant velocity joints. The GAZ-69 as a joint ball is used. It is most suitable for machines of mass production, is compact and high reliability. Compared with the previous model, the “sixty-ninth” has provided greater comfort to the driver and passengers at the expense of the sidewalls of the tent, protecting from the weather and wind, as well as by installing a powerful heater. For reliable engine starting in cold weather has provided a powerful heater, which warmed up the water in the cooling system. The production of GAZ-69 was stopped in 1971. In the history of the Soviet automobile GAZ-69 terrain took its rightful place. And still individual instances of the vehicle occur on our roads.